When it came time to chase down the dealer at which I would get the best price for the truck I was going to buy I soon learned how not to go about contacting dealers. Most if not all dealerships have some sort of Contact Us page on their web sites where you fill out an email form, field by field, entering your name, email address, sometimes phone number and finally your message. Do not do this! If you do you will find yourself bombarded by absolutely idiotic, automated replies that completely ignore what you’ve written, mindless salespeople trying to sell you whatever they have on the lot, or somebody that will say anything they think you want to hear in order to get you to come to their dealership. If you give them your phone number you will get phone calls from dealers who will press you and press you again and again to come down to their dealership because they know people they can get through their doors represent their best chance at making a sale with the largest profits. If you fill out those forms you will also find yourself subscribed to promotional mailing lists where dealers send you advertisement after advertisement about things in which you have absolutely no interest–you are going to get SPAMMED. On some dealer web pages you may find a section where dealer personnel are listed or pictured and sometimes their individual email addresses may be published. For the most part you want to avoid contacting people listed there too. Sometimes you will see people listed as Internet Sales Specialists or some similar title. Very often these so-called specialists only specialize in one thing which is getting customers to come down to the dealership. That said, there is something in the world of General Motors (GM) made vehicles (Chevy, GMC, Buick, Cadillac) called a Certified Internet Manager. These are individuals who go through special training provided by GM in subject areas that include product knowledge, customer satisfaction, social media, etc. [Note: I had originally written here that GM Certified Internet Managers are also pledged to uphold high standards of ethical behavior. I was mistaken. They are not, but they are trained in customer satisfaction and receive ongoing training to maintain their certifications. GM also has a “secret shopper” program to check up Certified Internet Managers to make sure they handle customers properly,] I only dealt with one GM Certified Internet Manager and his conduct was top notch. No hype, no pressure, just answers. His name was Bobby Tamayo at Home Motors in Santa Maria CA. I had several email contacts with him while I was still shopping for a Chevy truck, before I ordered a Ford. I’m publishing his name and dealer information here because any car dealer that handles things so professionally–IMHO the exception to the rule–deserves a nod. (I have no affiliation with Mr. Tamayo or Home Motors.) I think it may be OK to interact with GM Certified Internet Managers for doing pre-purchase product research but if the word Certified isn’t part of their title I would steer clear. Even if it is I’d be alert. In general, when it comes to negotiating price, the only people you want to contact whether their individual email addresses are published on the dealer web site or not would be those with titles such as Sales Manager, General Sales Manager, Owner, or Principal. These are people with the final say-so as to which deals get approved and which do not. Regard anyone else as a roadblock, an obstacle to getting the deal you want. The exception here would be when you contact one of these final authorities and they put somebody else in charge of the situation. Do not use a dealership’s web-form email under any circumstances, even when you know whom it is you wish to reach. It may require some effort tracking down the right person to contact. Sometimes his or her name and individual email address can be found on the dealership web pages. Many times not. In the latter case my method of getting contact information was to telephone the dealership and ask for the name and email address of the General Sales Manager (GSM). Sometimes the receptionist or other individual answering your call will happily provide that information straight away. Other times people will ask you “what’s this about?” or “can I help you with something?” in an attempt to misdirect your efforts to his or her focus and away from your own. Don’t play their game. Your answer needs to be something like “I have business I can only handle via email with the General Sales Manager. May I please have the contact information I requested?” Stand firm and do not allow yourself be dragged into a conversation you do not want to have. What you are after is the contact information you called to get and nothing else is acceptable. You stand a better chance of the most favorable outcome if you stand firm with anyone who is resistant to giving you that information. If someone is not cooperating with you ask for his or her name. Jot it down and hang up. Complain to dealership management about the uncooperative nature of that indivdual if you care to, or just make sure you don’t speak with him or her when next you call. You can call back later and hopefully get somebody more cooperative on the phone or blow off that dealer entirely. There may be instances where you cannot obtain the name and email address of the GSM no matter what you do. If there other dealers in your area just move along to the next. If not you may need to invent a different strategy. The point is that you really want to deal only with the person holding final authority over deals unless that person hands you off to somebody else. I live in the San Francisco Bay Area where there are many dealers for American made vehicles and I was willing to travel for 2-3 hours if it meant getting a great deal on a truck. My willingness to travel gave me even more options of where to buy. If I didn’t get cooperation from one dealer I just blew them off and went on to the next because there were many others from which to choose. This was the exception, however. Most of the time I was able to get the required contact information without much trouble. Using the methods described above I created a list of dealers, GSMs, email addresses and phone numbers. I actually made a spreadsheet with fields for all those things and one for notes. (A database may have been better but I didn’t have a data base program.) I kept track of which dealers I contacted and at what stage of progress things were–whether I had emailed, was waiting for a reply, whether a bid had been received and for how much, etc. Does that seem like a lot of trouble? Would you do it to save, oh, say maybe $2,000? I would and I did. I don’t need to be sold. I’m already sold. I know the truck I want. All I need is a very good price. I cannot know how much your real cost would be on the truck I am ready to buy. That’s none of my business and it doesn’t matter. What matters is how your sales price will stack up to others. I have an awareness of manufacturer’s incentives, holdback, volume bonuses, invoice prices, NadaGuides, TrueCar, etc., and of course I know the MSRP. I know that I can buy this truck well below invoice. I want to know what your bid would be. If you would like to do business with me in this straight forward manner you will find the truck I want described below. Send me your quote and we’ll go from there. Please breakout all charges–tax, license, document fees, etc–and include them in your bid. This is a spreadsheet I built from the Preview Order and other sources. It represents the vehicle I ordered. If you do not have a Preview Order made by a dealership you can put together a spreadsheet something like this. 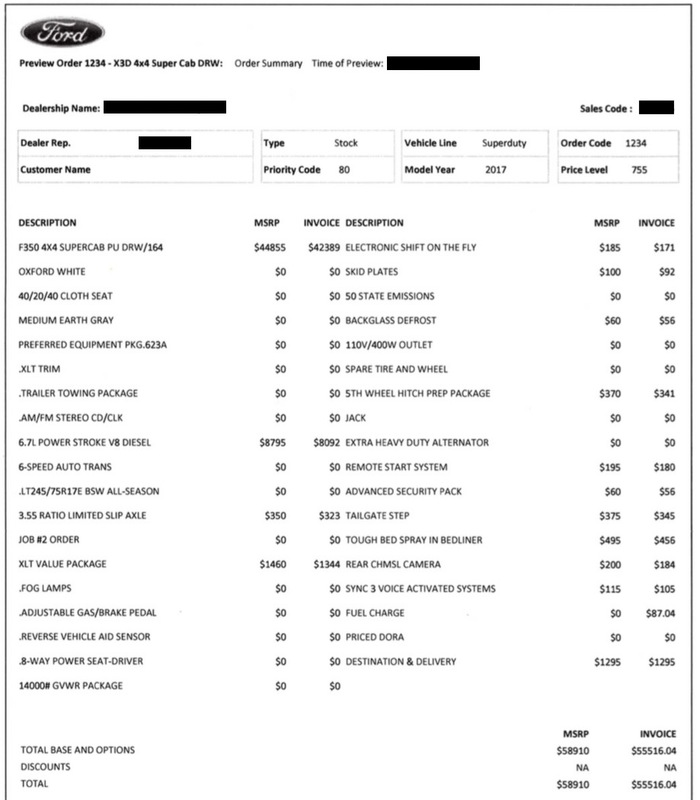 Along with my email I included either a screenshot of my own spreadsheet (above–click to enlarge) showing the Invoice and MSRP for the vehicle, packages and options I wanted, and in later emails I sent a copy of a Preview Order (below–click to enlarge) I allowed a dealer to make when I test drove a truck. Surprisingly, the Preview Order included not only the MSRP of each option and package but also the Invoice price for each. Remember, Invoice prices are what the dealer’s pay, but also remember the dealer has other ways of profiting even if they sell you a vehicle at Invoice or below. This Ford Preview Order was put together by a dealer at which I test drove a truck (dealer information has been redacted). 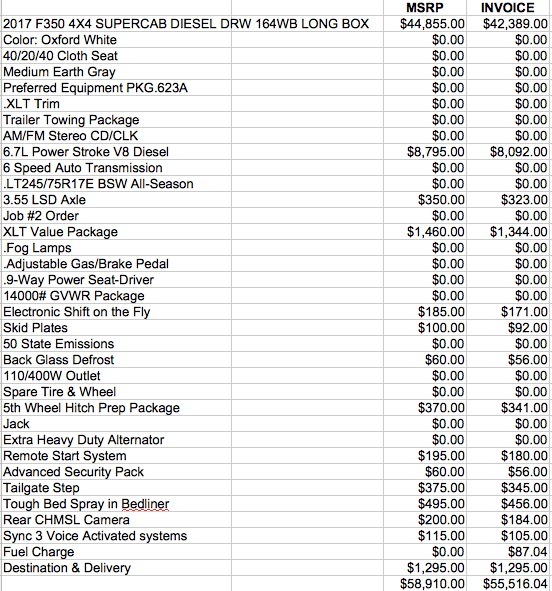 The Preview Order shows the truck I ultimately ordered and includes the MSRP and Invoice prices totaling $58,910, and $55,516. The best bid I received, and I received the same bid from three dealerships, was $2,000 under invoice, $53,516. That’s $5,394 below MSRP. Here I want to take a little side journey, not because it will help you get a better price but rather because it helps explain why a dealer would show a customer Invoice prices and why it is to the dealer’s advantage to do so. Over time manufacturers have been raising Invoice prices closer and closer to MSRP making the margins smaller and smaller for dealers, but, and it’s a big but, at the same time they have been moving dealer profits into other, hidden places such as holdback, volume bonuses, etc. When Invoice prices are close to MSRP it creates the impression that customers are getting better deals than they actually are. The customer is led to believe dealer profit is represented by the difference between Invoice and MSRP. While some of a dealer’s profit may be found there, in many cases such as when a dealer sells a vehicle at or below invoice the profits are found elsewhere, in holdback and dealer incentives. How else could a dealer sell a vehicle at or below invoice and still make money, still stay in business? I heard of one instance where a car’s MSRP was only $100 above Invoice. There is no way a dealer could stay in business making only $100 per car, and obviously no way a dealer could stay in business selling cars for below Invoice unless he is making money on the deal that isn’t visible to the customer. When dealers offer customers selling prices that are so close to Invoice customers who don’t know about the back channels of dealer profits may be led to believe the dealer is making less than he is, and that the customer is getting a better deal than he is. That’s why dealers want you to see these “fake” invoice prices–fake because dealers are compensated in ways apart from the now deflated markups. I said it earlier, Invoice price means nothing, MSRP means nothing. The only thing that matters from the perspective of price is which dealer is going to sell you the vehicle at the lowest price. Back to the adventure of getting the best price on a vehicle… After sending out my emails to GSMs at dealerships I waited for their replies. Some did not reply, either because they didn’t want to play, perhaps not sensing enough profit potential, or because they didn’t get my email, or some other reason. Some dealers replied with what turned out to be average prices, some replied with above average prices and some with below average prices. Some replies were timely and some came so late that I’d already made a deal on my truck. In the end three dealers offered me $2,000 under invoice. 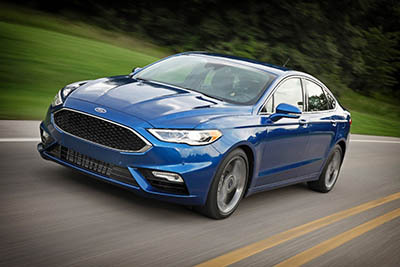 If holdback is 3% on Fords the dealer will only receive $1,767 from Ford on this sale. Does that mean the dealer is selling below his cost, below his real cost, even after he gets the holdback? Why would he do that? He wouldn’t, not unless he’ll be making money some other way, perhaps on a volume bonus based on how many cars they sell in a given month, quarter or year. They may be getting hundreds back on certain vehicles at certain times for certain reasons. I don’t know for certain, but one thing I do know is that no dealer is going to sell me a vehicle that only results in a loss. There has to be something in it for him. One dealer tried to convince me that any dealer offering me $2,000 under invoice on the truck I wanted was lying because there wasn’t that much profit in the deal. He also suggested that when I go to pick up the truck the dealer is going to come up with some reason not to sell it to me at the agreed upon price. Was he right? Only time will tell. My truck isn’t supposed to be delivered for another 5 weeks or so. I’ll let you know what happens then. If you aren’t subscribed to my blog and want to find out what happens subscribe and you’ll get notified whenever I make a new post. I found it of some comfort that I requested bids from so many dealers and got a range of replies and non replies. I think some dealers may have felt it wasn’t worth interacting with me because they could see they would have to settle for only a small profit so they just didn’t bother. Others may have figured that it wouldn’t hurt to toss their hat into the ring and hope for the best while a few dealers seemed willing to cut their asking price to the bone in order to make some money rather than none at all, perhaps hoping to gain my business in the service department making profits later on. I cannot be certain of anything other than I sought numerous bids and took one of the three that were $2,000 under invoice, some $2,800 under the highest bid I received and almost $5400 under MSRP. When you get a wide range of prices offered to you I think it’s a good bet the lowest bids are likely as close to the best you may do. Did I get a good deal? You can have your own opinion about that. All I know is that I got the best deal I could find and I hope my writings on this subject help you do the same. Part Four of this article will include a list of some of the Ford and Chevy dealers with whom I interacted and where IMHO they fell along the spectrum of price and customer service. This info may be more meaningful to people in my geographic area. Meanwhile, I’ve given you what I can in terms of information you may find useful in shopping for a new vehicle. Part Four will also include information as to whether or not the dealer from whom I ordered delivered at the price they promised or if they tried to pull a fast one.